This exhibit features a series of letters written by Emelius W. Fuller, a Confederate Army officer, during his time as a prisoner of war in 1863. Fuller was the commander of the St. Martin Rangers Company Infantry in Louisiana, and captain of a boat called the Queen of the West. He was seriously wounded and taken prisoner when his boat was destroyed on Bayou Teche, April 14, 1863. 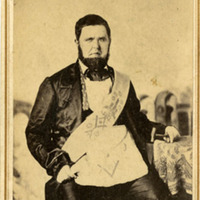 Over the following three months, he wrote letters to his wife, Mary Haskell Fuller, in a book given to him as he recuperated at St. James Hospital in New Orleans. Using blank leaves in the book, an illustrated dictionary of flowers, Fuller wrote seven letters, from April to July of 1863, which have been digitized and transcribed for this exhibit.